Had to post this image to kick off September! Been listening to the news and weather reports and they are in agreement; fall is coming early to Ontario! So I thought I'd offer proof of just how true this is. 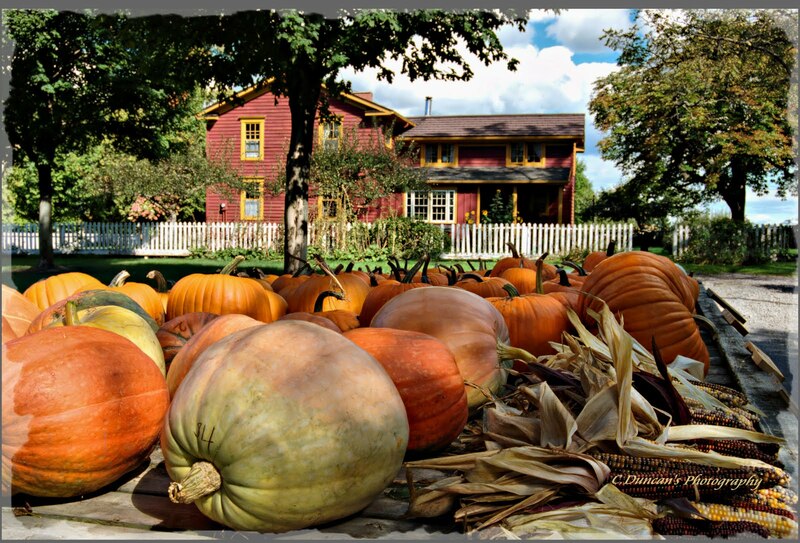 This is a beautiful farm in the Pelham County Region. Stumbled upon it quite by accident yesterday, and was smitten with it's rural charm! 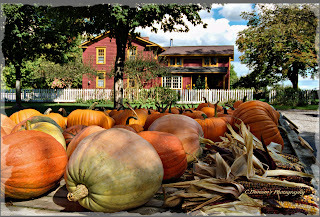 And behold all the pumpkins already maturing! In fact, the experts are telling us that they're so early, we may not have any for Halloween, that they'll all be gone by then! Sheesh! Anyway, this pumpkin stall with the gorgeous home in the background seemed like the ideal way to herald in the approaching fall season. And as no one seemed put out that a photo buddy and I were happily snapping away at this lovely scene, we also made sure we bought some of the lovely produce to take home with us as a thank you for their graciousness. And really who could resist such wonderful charming bounty? Wouldn't be a photo day in the country without it. So here's the low down on the stats for this image for all you photo buffs out there. Late morning light/partial shade was available, used 1/200 sec. @ F/9, ISO 200, 24mm fl. 18-55mm kit zoom, center-weighted metering, handheld, Nikon D80. So, I gladly welcome Autumn with all it's color, textures, charm, and beauty! And gosh, even the memories associated with pumpkin picking, jumping in the piles of leaves soon to follow, and the arrival of comfort food are delightful things to think on! So thanks for letting me ramble on! Feel free to leave me a comment on your favorite fall memory, and get ready to enjoy all that Autumn has to offer!